For many students of science, there appears to be little middle ground regarding the subject of organic chemistry—it is either loved or loathed. 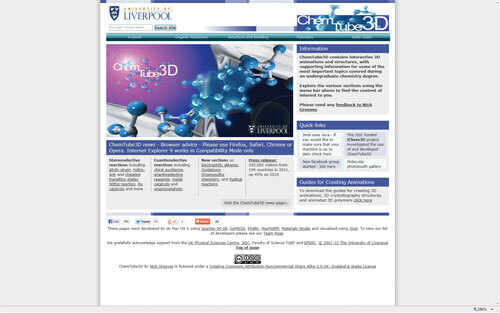 Thanks to ChemTube 3D, a wonderful online resource from the University of Liverpool, professors of organic chemistry may have a new tool to genuinely excite students about the subject. ChemTube 3D uses Jmol to provide site visitors with the 3D structures for many important compounds and classes of compounds encountered in organic chemistry. However, beyond simply providing chemical structures, ChemTube 3D provides students the opportunity to step through major types of chemical reactions, demonstrating through animations how two molecules react with each other. In addition to major classes of organic reactions, site visitors can explore sections covering polymers, solid-state structures, and aspects of structure/bonding such as orbitals and molecular vibrations.